Hantverk & Found in Margate present the first solo exhibition of work by ACS member Twinkle Troughton in three years. Troughton’s output often explores connections between the past and present, with a focus on socio-political issues. Her most recent body of work is inspired by Aesop’s fable ‘The Frogs Who Desired a King’, a moral tale often interpreted as a warning against challenging the status quo. Troughton reinterprets the amphibian characters of the fable with a focus on the modern day complexities of the conflict in Syria, where the reality of revolution has caused many citizens to hark back to the time before the conflict began – echoing the ‘be careful what you ask for’ moral of Aesop’s tale. The artist uses subtle references to Syria in her depiction of landscape, for which she has drawn inspiration from the work of famed war painters such as Paul Nash. 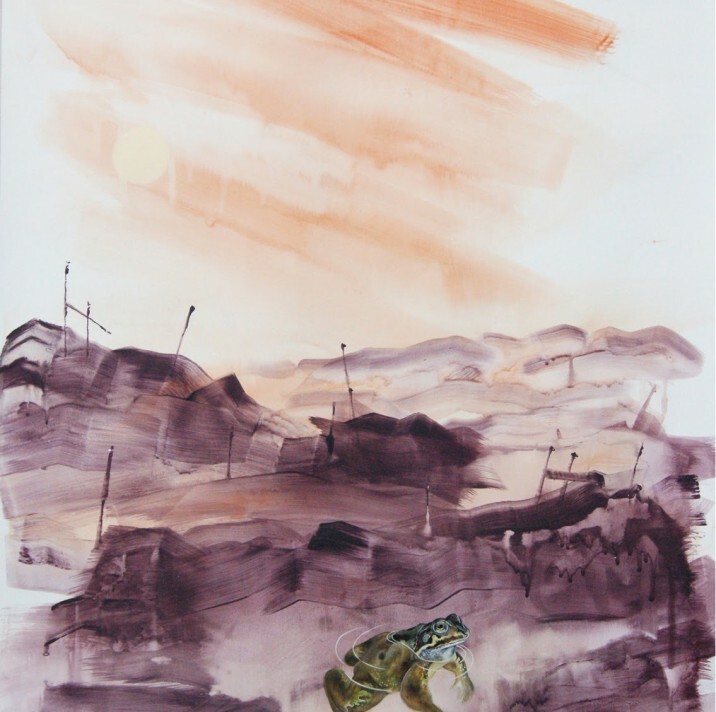 While much of the canvas takes on an abstract feel, with broad brushstrokes forming the land and sky, each of the frogs in the paintings are executed in minute detail. Many landscapes feature knotted trees painted using the ancient sgrafitto technique, further referencing the ancient origins of the fable. 10% of all sales from the exhibition will be donated to the Hand in Hand for Syria charity. In addition, the gallery will be hosting a vegetarian dinner and storytelling night, with traditional Middle Eastern folk tales and stories collected from Syrian refugees, to raise funds for Hand in Hand for Syria on the 30th of June. For further information, and to book tickets, please visit the Hantverk & Found website here.